All the entertainment of a Cabernet & Canvas public class, but just for you and your mates. 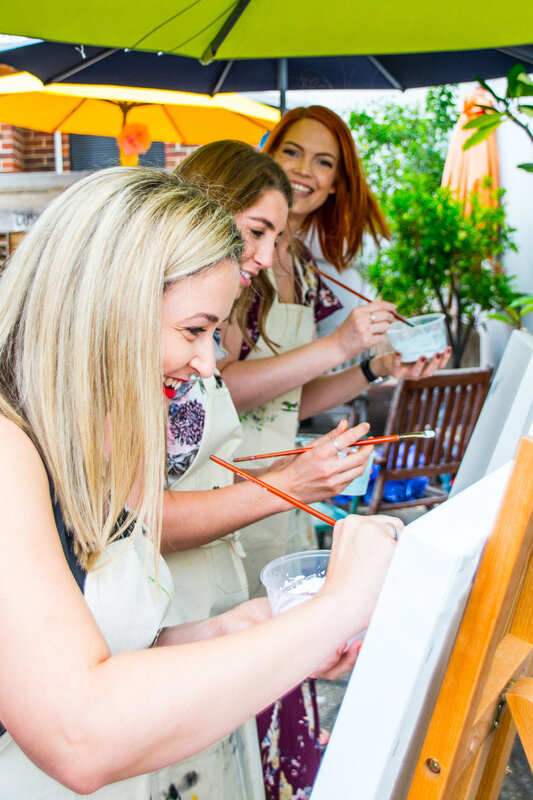 Private parties with Cabernet & Canvas follow the same format as our public classes, but they are tailored to suit your group of friends and we can come to you. We supply everything required to paint your chosen painting for your event and create a fun experience for you and your guests. Think You Need To Be Artistic? Think Again! One of our Artists will guide you and your guests step-by-step through your chosen painting. Private Parties can be reserved wherever and whenever you’re feeling artsy. Host a Private Party at any location - homes, restaurants, bars, offices, community centres... anywhere! Or, feel free to choose from one of our established venues, where available. Parties last between 2 and 3 hours (not including set up and pack up) depending on the complexity of the painting. The hosting schedule suits afternoons and evenings on any day upon availability. Start or end your celebration with us, or make us the main event! We charge $55 per person with a minimum cost of $550 per event (10 people at $55 pp). Please contact jaccie@cabernetandcanvas.com.au for discounts applying to larger groups.